What does it take to succeed at science crowdfunding? Join us for a free panel discussion on the topic, broadcast live on YouTube and Google+. 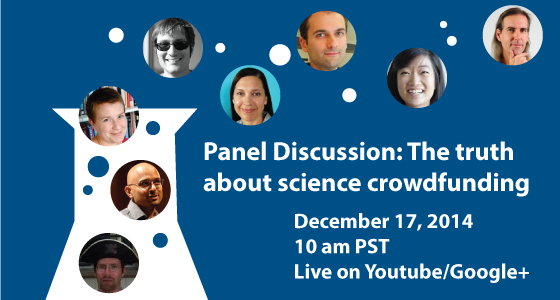 Our panel features scientists who have succeeded at crowdfunding, researchers who are studying the field, and even a founder of a science crowdfunding site. And we’ll be taking questions from the audience, via Google+ and Twitter (use the #SciFund hashtag). We are sure to have a fascinating discussion, so please jump in! Previous SciFund science crowdfunding paper published!